Yesterday I attended the August Mission Arts and Performaning Project (MAPP), where various arts venues, businesses and private homes open themselves up to present artists in the community. This month was actually a lot smaller than the June MAPP, but there was still more than I could see in my brief visit. 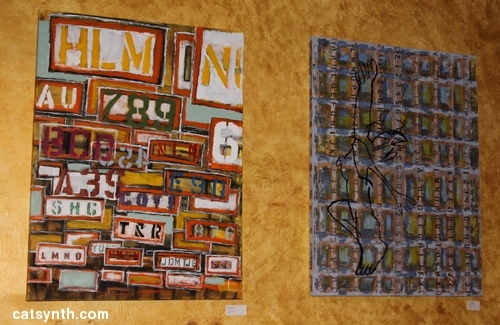 I started, as usual, at the Red Poppy Art House, which serves as the hub for MAPP. Here, Red poppy Resident Artist Hersalia Cantoral from Chiapas, Mexico, was holding court in an informal discussion. Some of her drawings were on display alongside other artists. We then wandered down Folsom Street to the “Blue House” and saw singer/singwriter Vanessa Valencia perform some of her songs. She was particularly focused on an ear infection she was suffering through, and even improvised a song about it with strong encouragement from the audience. Later, we found ourselves at L’s Cafe listening to another singer songwriter, Bhi Bhiman. His performance was very polished and fun to listen to. I particularly liked his “White Man’s Burden Blues” (or “Rudyard Kipling Blues”), in which he wove references to various peoples around the world who have had…well, “challenging” experiences with Western colonialism into an up-tempo traditional blues song, much to the delight of the audience. (I am not sure what the deal was with the red clown noses that several people were wearing.) He was giving away free CDs that I was eager but too slow to get – but someone was generous enough to offer me hers, so she gets a big “CatSynth thank you.” By coincidence, there were two paintings by Melisa Phillips on the wall. I have reviewed her work from previous Open Studios, and would be remiss if I did not mention her again. Her works incorporates text, and in more recent pictures, body images into a unified space. Also on display was the work of RUBYSPAM, which I also recognized from a previous event. There was overall a good mix between performing art and visual art this time. Our next stop was Galería de la Raza, which was exhibiting YTREBIL, a solo exhibition featuring prints and drawings by Enrique Chagoya. Chagoya has quite an interesting biography, birn in Mexico City in the mid-1950s, studying at the San Francisco Art Institute, and now a professor at Stanford. His works on display included a mix of political, pop culture, cartoon and mythological references, often in surprising combinations. There were numerous caricatures of George W Bush (and at least one of Condoleeza Rice), as well less quickly recognizable references. 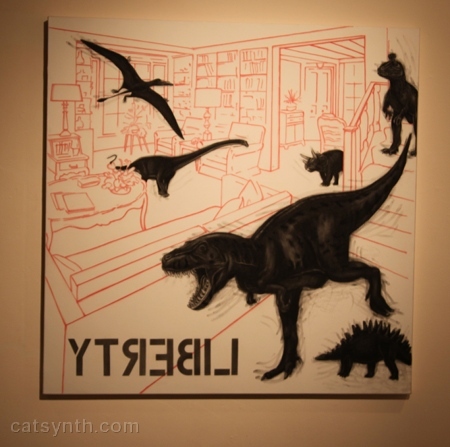 The iconic image of the exhibit featured the title, here clearly visible as “Liberty” spelled backwards, with dinosaurs running amok in an otherwise comfortable looking living room. I particularly liked some of his longer works that combined mytholigical imagery with cartoon images and narrative structure that one might find in comics. This was featured in his “Illegal Aliens Guide” series, such as the Illegal Alien’s Guide to Critical Theory in which stereotypically attired figures from the US-Mexico border region discuss issues from academic critical theory beneath a large figure with that looks like a Central American mythological figure wearing a white T-Shirt and jeans lying on a platform. There is also the Illegal Alien’s Guide to Relative Surprise Value (maybe I should read that, given my general lack of interest in economics). Our final stop was Area 2881 to see the latest incarnation of the robotic sculptures and “lumino-kenetic art” by Carl Pisaturo that I had seen at a previous MAPP in 2009. 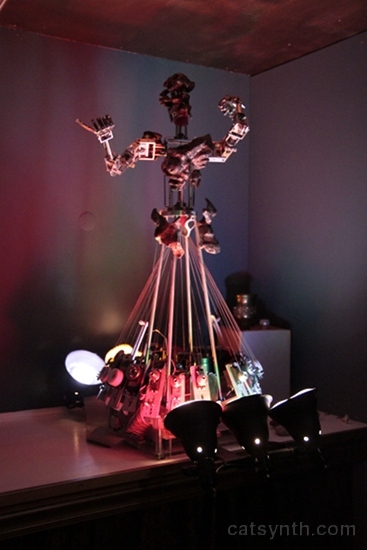 The robots and rotating mechanical pieces of light and motion were on display once again, and this time I got great photographs. 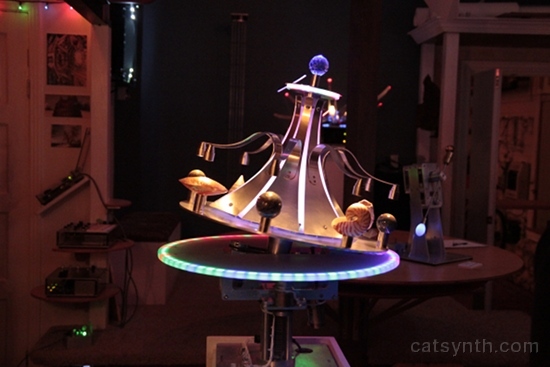 There was at least one new piece, a sci-fi-ish floating contraption that was both fish-like and spacecraft-like. I was not able to get a good image of it. Overall, the objects were all impressive in terms of the technical expertise and discipline that went into their creation – it requires not only an understanding of electronics but mechanical and industrial design – as well as the mesmerizing aesthetic quality that kept us viewing them for quite a while when enjoying Area 2881’s signature cocktail. They also had a series of 3D photographs on view. Like a more advanced version of the 3D viewmasters I remember from the late 1970s, one could peer in and see scenes with depth and detail, such as a party in the Castro, and an organist sitting down to begin her performance, and a church with stained glassed windows and vaulted ceilings moving out into the distance. Posted on August 8, 2010 August 9, 2010 by catsynth	This entry was posted in Art, Music, Reviews, San Francisco and tagged #mappmission, area 2881, Art, bhi bhiman, blue house, carl pisaturo, diy, enrique chagoya, galeria de la raza, mapp, melisa phillips, mission, mission arts and performing project, Music, red poppy art house, review, robotics, rubyspam, San Francisco. Bookmark the permalink. Must’ve taken a lot of time and work to get people to participate and open up their homes for the shows. Impressed with the robotics pictures. What fun! I have never heard of private homes participating in an organized visual & performing art show on the scale that you showcase in your post. It seems like the crowd would be much more intimate and receptive to the performances and art work. Very cool! Will have to see if this is offered in my area.